Accepts user codes or firefighter’s key. Can be flush- or surface-mounted. Trim ring available for surface-mounting. The 5860 is designed to look and operate exactly the same as the built-in annunciator. Features include an 80-character backlit LCD providing easy-to-understand system messages. The annunciator is ergonomically designed with over-sized buttons for the most frequently used features, Reset and Silence. In addition to status messages displayed on the LCD, five LEDs for alarm, supervisory, trouble, silence, and AC power indicate status. The annunciator is available in gray to match virtually any decor and red for applications where the annunciator must stand out. The annunciator enclosure can be surface or flush-mounted. A trim ring kit is available for surface mounting. When the system is normal and receiving AC power, the Power LED is lit and all other LEDs are off. Other LEDs turn on as the conditions occur. 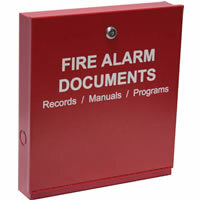 Users identify themselves to the control panel by entering a code on the annunciator or by turning the firefighters key. When a user presses a button, the annunciator piezo beeps and the LCD prompts the user to enter a code or other relevant information. Multiple users can work at different annunciators simultaneously without affecting each other. Features include an 80-character backlit LCD providing easy-to-understand system messages.